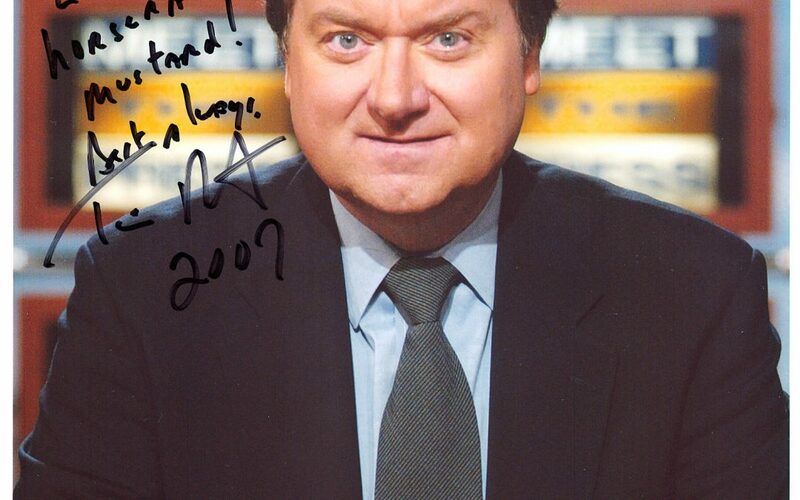 It came as a shock when I heard of the passing of Tim Russert. Back in 2004, I believe it was March and just after Tim’s book “Big Russ and Me” was published, I was contacted by one of our loyal customers who informed me that Tim mentioned Weber’s Mustard in his book. Honored, I decided that I needed to find a way to get to him and say thank-you. I had worked with Tim once during my news photography career when he was honored by Saint Bonaventure School in West Seneca. The experience was a treat and knew Tim as a warm and personable individual. Well, it was a few days before Father’s Day in 2004 when I got word that Tim was going to do a book signing at a book store in Amherst— so I worked some magic and made contact with the store to secure a spot in line to thank Tim for his positive mention and now, world-wide recognition of Weber’s Mustard. I put together an assortment pack of our products and made way to the book signing where I was to pick up a reserved copy of “Big Russ and Me”. Before Tim arrived, it was stated that he would do only one name personalizations during the signing. I was #4 in line when Tim and Big Russ made their way out. As I approached, I moved around to the back of the table, sat the case of mixed products on the floor next to his left leg and put my hand on his shoulder. As he looked up, he saw the Weber’s logo on the yellow polo shirt I was wearing and with a huge smile said “Weber’s Mustard!!! !” With hand still on his shoulder, I said “Thank-you for the name mention”. He continued smiling ear to ear…. I made way to the front of the table and waited patiently as he signed a couple books for my Mom, but never took his eyes off me and just continued to smile. I handed him the copy of the book I purchased and said “I know you’re only signing one name personalizations, but would you sign a copy to my staff?” He took the book, signed and inscribed it “To the Staff at Weber’s! Great Mustard! Tim Russert”. His Dad, Big Russ, also signed the book…. We corresponded back and forth since that day and he was always there to answer a question I had regarding making contact with various prominent people. Our last communication was right before last Christmas when I sent him a unique Weber’s gift and asked him for a signed photo to display in our entry foyer here at Weber’s—-he overnighted this photograph to me immediately after receiving the gift and request….